Like many other people, (especially women) I have a tendency to place myself low on my priority list and I’m beginning to be more conscious of the negative effect this has on my ability to take care of others. So, I’ve decided that I’m going to make it a priority to spend a little time each week doing something for myself that is soothing, relaxing and restorative. 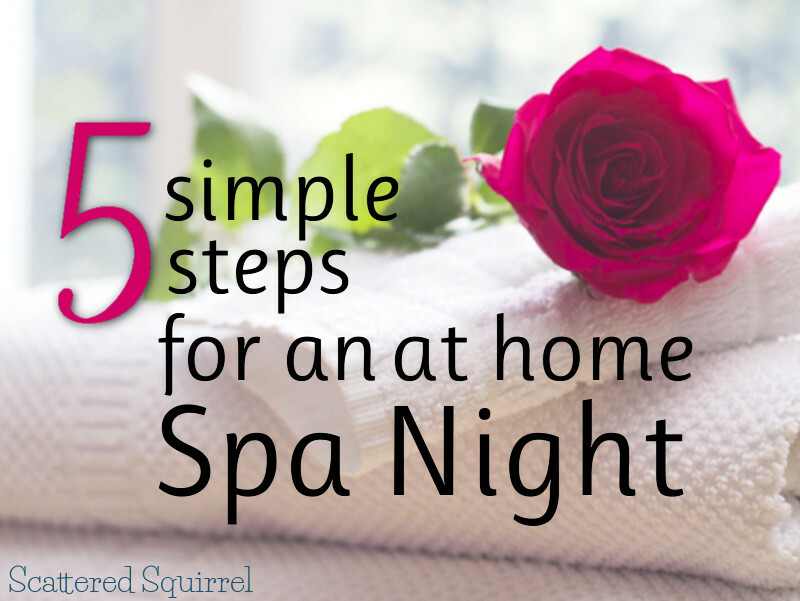 One of my favourite ways to carve out a little time for me is by taking one hour each week to have a simple spa night at home. I know myself well enough to know that if I try to fit too much into these nights I will find reason to avoid them, so I take a simple approach that requires very little time or effort to set up, so I can sit back, relax and recharge my internal batteries. As I said above, I’m all about keeping it simple. Not only does it mean set up and clean up is quicker, it means I’m more like to actually do it. If I have to spend a ton of time preparing stuff I’m going to find an excuse not to do it. In fact, that would be my excuse – it takes too long. So I’ve developed a simple spa night routine that does the trick for me. Less really is more. epsom salts or bubble bath your choice and totally optional. candles and music if that’s what you want (totally optional, but an easy way to add a little extra niceness to your ‘me’ time. Dry brushing is simply using a body brush to, well, brush your body. Use long, sweeping motions brushing towards the heart to help loosen dead skin cells and stimulate the skin. Be gentle, it shouldn’t hurt just leave a tingling sensation. Dry brushing has many wonderful benefits for your skin. It can help increase circulation, it’s been rumored to help fight cellulite (who doesn’t love that) and it’s a great way to exfoliate. I stumble on this article from New Nostalgia a long time ago, and I loved it. She walks you through the right way to dry brush so it’s worth a read – 5 Reasons Why You Should Dry Brush Your Skin. Pick the water temperature that you like, and add in some epsom salts or bubble bath. Then roll up one of the towels to use a neck support and sink in and enjoy. Relax for at least 30 minutes. choose a time of day or evening when it’s quiet. if you can, dim the lights, you don’t want it too dark but soft light can be really soothing. try not think about anything – let your mind drift. This is a worry and stress free zone. bring some water with you – staying hydrated is important, especially if you like hot baths. Feel free to skip this step if you want too, but I like to finish off my spa night with a homemade brown sugar body scrub. Like my face mask, I shared my recipe for this over on Restful Living too – Spa Recipes: Easy Sugar Body Scrub. In that post I use moisturizer to make my scrub but you can easily use coconut or olive oil if you would prefer. Because Step One is to use a dry brush, don’t scrub too vigorously this time either. Pay a little extra attention to areas that are prone to dry skin like feet, hands and elbows. And BE SUPER CAREFUL GETTING OUT! The tub will be slippery when you’re done. I like to spray the tub with a vinegar/water cleaning spray and wipe it out when I’m done. After you’re out of the tub and have rinsed it out, it’s time to remove the face mask and moisturize. To remove the face mask I use a soft wash cloth and warm water. The wash cloth not only helps take off the face mask but it also adds a little extra exfoliation into the mix. Apply your favourite facial moisturizer. Take a few extra minutes to massage it in. Apply your favourite body moisturizer. 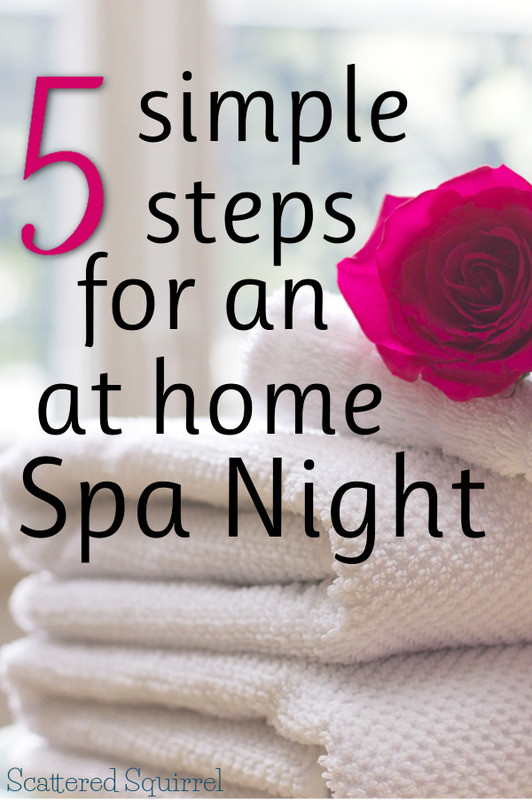 You can easily take a simple spa night and send it over the top if you want too. Here are few ways you can add some extra decadence to your night. After those five simple steps you should be feeling rested and relaxed. Combining a couple of DIY spa treatments with a relaxing bath is a great way to pamper yourself a little. It makes a wonderful end of week treat, or a great mid-week pick-me-up. Not only is this an easy way to carve out some time to take care of you, it’s also a quick. Less than hour start to finish (unless you decide to soak for longer) which means it’s hard to use the “I don’t have the time” excuse. Which is one I’m so guilty of using. Whether you follow my advice and have an at home spa night, or have your ow way of relaxing, be sure to set aside at least an hour for yourself each week. Rest, relax, and recharge those internal batteries. You deserve it! How do you carve out time to take care of yourself? Do you have any favourite DIY spa treatments you like to use? I’d love to hear from you! You know I need this! It’s so important to take care of yourself, but it’s always the last thing that happens for me. Luckily my husband recognizes that and pushes me to have a little time for me every once in a while. Thanks for some wonderful ideas! My husband is pretty good about sending me off to take some time for me too. lol I’m thinking I need to start scheduling in time for me into my planner, maybe then I’d remember to do it. I could sure use a spa night right about……..NOW! You and me both! Well I don’t need the pillow to punch but I could definitely use a spa night. You should for sure take some time to rest and relax and look after you for a little bit! Ah self care. I am bad about this no doubt. Thanks for the ideas – time to break out a candle! I am sharing these with others! After the week I’ve had an at home spa sounds like bliss right now!